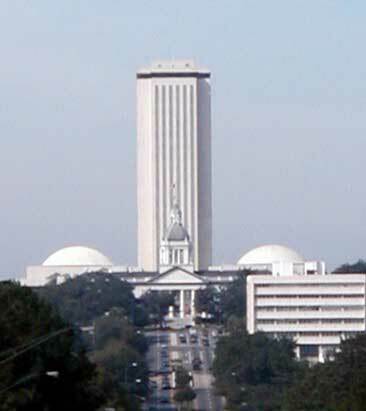 Am I crazy, or does the tall tower flanked by two hemispherical domes look like the Florida government is sending its citizens a message? To paraphrase Dave Berry, I am not Photoshopping this - Google it yourself. The architect has got to be laughing himself silly. UPDATE: It gets better and better. Apparently women's groups chose the steps of this building as their venue for trying to reignite interest in the ERA. What do they call it? Viagra tower? I always thought that the architect must have been a member* of the opposing party. *In more ways than one? Nice. This is precisely the type of thing that makes me proud to be a Sunshine State citizen. I live in Tallahassee and, as my own little private protest, often give directions in the area around the Capital building as, "across the street from the northern testicle" or "cattycorner to the southern nut." I, too, am a Tallahasseean, and must say that it was quite a thing to see the first time I came to this town. Yipe. The first time I saw it, I laughed out loud. Coming down the Appalachee Parkway towards these buildings ... what a joke. The lovely little old capitol in front of the new one was originally supposed to be demolished so as not to obstruct the view. Tallahasseans pitched a fit, and good for them. Well it should be obvious. This is what politicians do to its subjects all the time. Just bend over and get ready. Rather fitting I would add. It's the Capitol Building people, it's full of members!